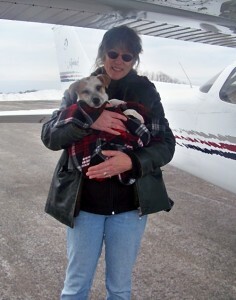 In just over 500 hours of flying Michele McGuire has helped save over 200 lives… the small furry kind. She didn’t start flying to save dogs and cats on missions for organizations like Pilots N Paws, but now she can’t imagine not using her Cessna Skyhawk to move endangered animals from high-kill shelters to the safety of rescue organizations that protect them until a new home is found. Looking back, McGuire’s initiation into transporting animals seemed predestined, as she’s the owner of a well-known business that helps pilots protect the hearing of their traveling canine (and feline) companions. 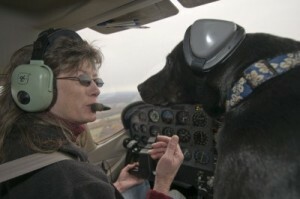 She had already learned to fly when she created Mutt Muffs, simple and effective hearing protectors for pets who fly in the loud cockpits of general aviation aircraft. On the company’s website she encourages pilots to share the stories of their flying friends, and it was one of those stories that changed her into an active volunteer. McGuire grew up in a family that always had dogs, and that continues to today, with their current dog “Cooper”serving as the inspiration for her company’s main product. It seems her husband doesn’t like to fly and Cooper has become her ‘co-pilot” by default. Her concern over hearing damage to her dog’s sensitive ears led to Mutt Muffs, and she now uses a portion of the proceeds from her business to pay for her rescue flights. With over 40 transport flights logged, she loves the idea of her pet products-based company being able to support her charitable flying, “What good is success if you don’t put it to good use helping those who truly have no way to help themselves? I fly every opportunity I get, but between weather and other obligations, I usually fly between two and three missions a month.” To encourage others to volunteer, she posts a “little travelogue” of her transport flights on her company website. To learn how you can volunteer for animal rescue flights, visit Pilots N Paws.